As an essential, legally required car service, many companies try to make the most off drivers who have no choice but to put their vehicle through an MOT. The maximum the British Government allows a business to charge for an MOT test is £54.85 and whilst it is unlikely to find many garages that will charge this price, it is equally as unusual to find many that price their MOT’s below the £30-£40 bracket. Whilst the reasons for having the Ministry of Transport test are both obvious and necessary, for many drivers, young ones particularly, the prospect of a £30+ mandatory MOT is unwelcome, especially if your car has fared poorly in previous tests. As an independant official MOT test centre in Plymouth that has grown over the years thanks to the loyalty of our customers, we at Marshall Motors SW believe that the least we can do is help to lessen the inconvenience that these compulsory tests place on drivers by offering the most competitive rate possible. This is why, irrelevant of the car’s model, age, make, etc. 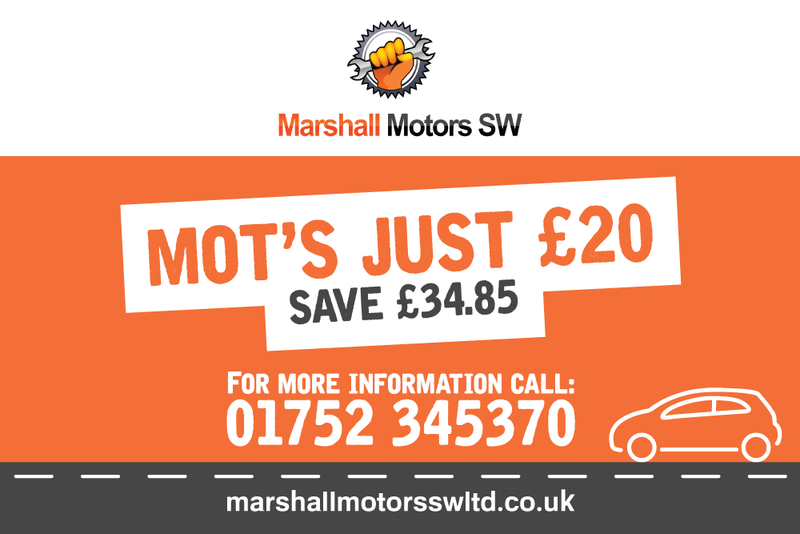 every MOT at Marshall Motors is just £20! Tests can be booked over the phone, by e-mail, or on our website, and you can even pick a day and time that is most suitable for you. On average an MOT takes between 40 and 50 minutes to complete, but we advise that you leave around an hour and a half free as the test may take longer, especially if repairs are required. For a breakdown of precisely what is checked in an MOT, please visit our dedicated page where you will also be able to get an idea of how likely your vehicle is to pass. Just a little tip on this note: around one fifth of tests are failed due to bulbs being out, so make sure you check your headlights, sidelights, indicators, brake lights, reverse lights, and hazards before you bring your car in to be tested. If any of them look like they are dead or dying then you’ll save yourself a lot of time and a decent bit of money by getting them replaced.